Tarik Cohen, a 5-foot-6 junior running back ran for 137 yards on 17 carries and three touchdowns in the Aggies 65-14 blowout of Howard University. The twenty-fourth ranked North Carolina A&T football team has accomplished a few things as the midway portion of the season rolls through. Two weeks ago, the Aggies passed a crucial test by beating MEAC power Bethune-Cookman. 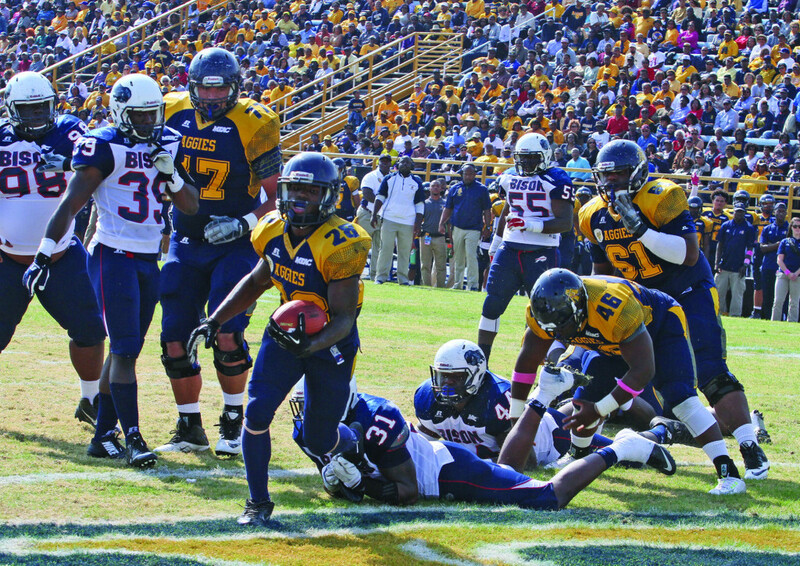 With that win, N.C. A&T entered Homecoming weekend nationally ranked in the FCS Poll. Last Saturday, the Aggies, who are also the No. 1 team in Black college football, routed longtime rival Howard, 65-14 to win the university’s fifth straight homecoming. The win secures N.C. A&T’s fourth straight winning season. The Aggies (6-1, 4-0 MEAC) have now won five straight and have not lost to a Division I-FCS program all season. N.C. A&T has also won nine straight over conference opponents at home dating back to 2013. Junior running back Tarik Cohen finished with 137 yards and three touchdowns on 17 carries. It was his fourth career three-touchdown game. For A&T head football coach Rod Broadway winning and meeting expectations simply means more will be added. Broadway followed up his jovial statement by saying the Aggies’ football program expects to be good. Despite his team’s six wins, he still believes his team far away from reaching its potential as a football team. The Aggies did find themselves trailing 14-13 to Howard (0-7, 0-5 MEAC) after Howard quarterback Kalen Johnson scrambled to his left and fired a dart on the run to the end zone where Tomlin Antoine dove on top of it for a 15-yard touchdown reception with 10:34 remaining in the first half. But the Aggies answered with an 11-play, 86-yard drive that culminated with a masterful 31-yard Cohen touchdown run in which Cohen made a couple moves at the line of scrimmage to break free before making a stutter step to avoid another defender in the open field and final juke move to sprint into the end zone. It was a downward spiral from there for the Bison. After a three-and-out from the Bison, the Aggies scored in four plays as senior quarterback Kwashaun Quick connected on an 8-yard touchdown pass to junior Denzel Keyes on a crossing pattern. Junior Cody Jones added a field goal before halftime to give the Aggies a 30-14 advantage. Howard stopped the Aggies on their opening drive of the second half, but Howard ended its first second-half drive with a fumble on a punt attempt which gave the Aggies the ball at Howard’s 21-yard line. After a 14-yard loss by Cohen, redshirt freshman quarterback Lamar Raynard completed a 15-yard pass to Cohen and a 19-yard reception to Keyes to set up a 1-yard run by Cohen to all but put the Bison away. N.C. A&T compiled 311 yards rushing as compared to Howard’s 31. Quick added 85 yards rushing and a touchdown on 11 carries. Redshirt freshman Amos Williams added 84 yards and a touchdown on 13 carries. The Aggies return to action Saturday, Oct. 31 when they travel to Tallahassee, Fla., to face Florida A&M in a 3 p.m. contest.